Hello! I am Miguel from Spain. This is my second jam ever (first was Minimalistic Jam 2 with https://comodoro.itch.io/i-have-no-clock-and-i-must-tick-tock). This time i will be developing a simple memory game. Here we go! The player must reach the goal (star) in the level in order to advance. It is done moving the player in a grid tile. At the beginning of the level, you can get a look what the level looks like, for about 5 seconds (may change). After that time, all tiles except the one with the player and the one with the goal will be hidden. The player must remember the way to the goal in order to reach it. For avoiding random movements, there will be a step limit each level. 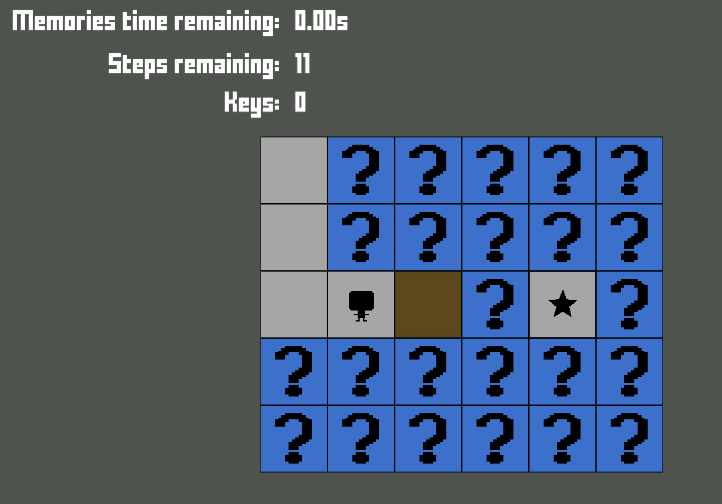 If the player takes more steps than allowed, level must be restarted. 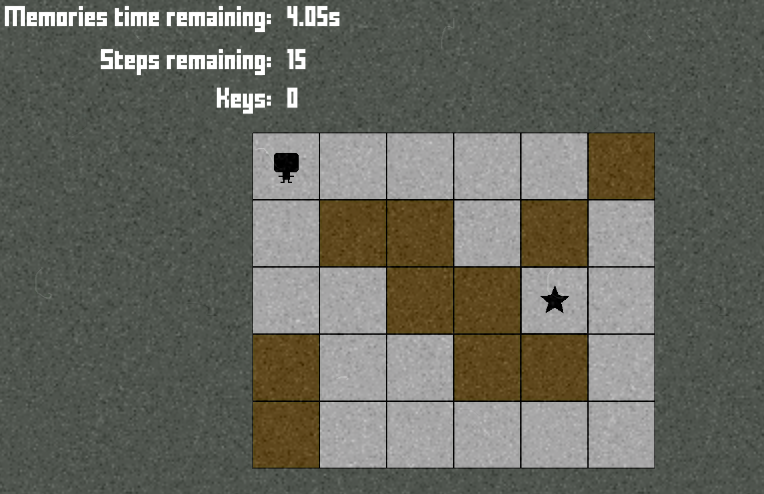 Obstacles: trying to go into an obstacle will consume an step and reveal the tile but the player cannot move into it. 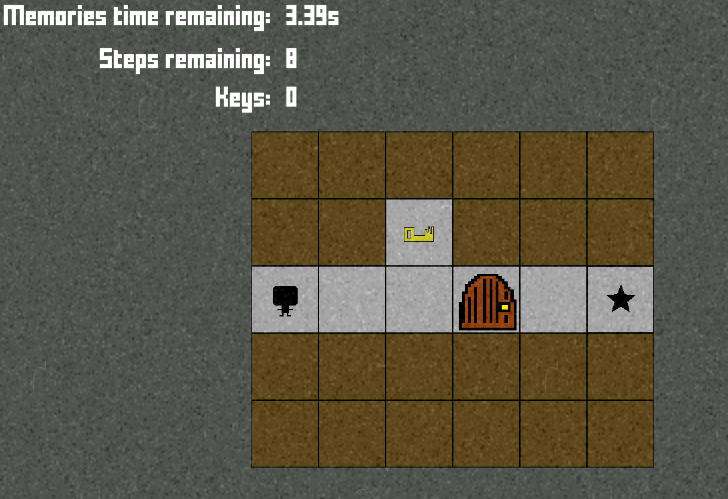 Door: same as an obstacle unless the player have any key, if he has a key, the door will disapear when steping into its tile. 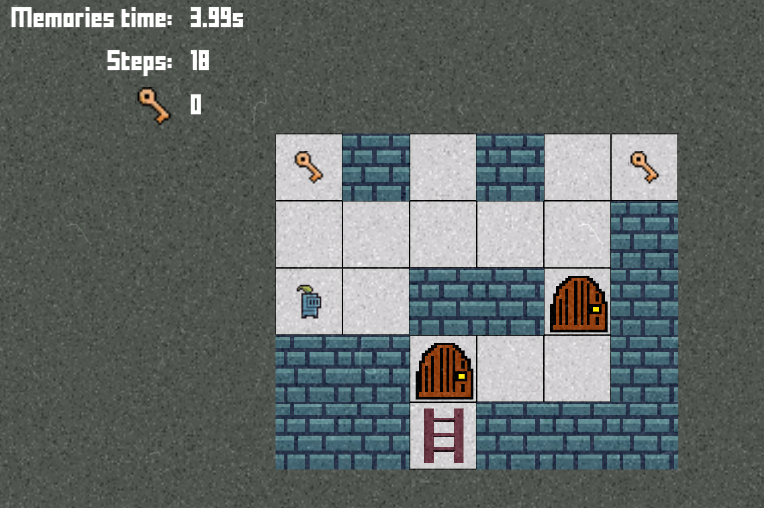 Key: the player will get a key when he steps into its tile. The key will disapear then. Spikes: stepping into this tile will mean instant restart. Main objects in the game (tiles, objects, player...). Simple sound before starting a level (memory time). Added noise filter in memory time. Design a lot more levels. Implement short memory time after the level starts (bonus like). hey miguel! this is a really well scoped-game--you've got a very easy to pick up game concept and it's awesome you're already adding content like extra levels and are planning for mobile controls. great work so far--if you get the chance to record a gif or video it'd be cool to see it in action! Thank you for your comments! Today I designed few more levels and added spikes to the mix, also some sound effects. Some levels grant an extra life after completing. Implemented Ceiling trap tile. After stepping out this tile, it becomes an obstacle. Added an option to activate memory time pressing SPACE. Completing a level grant 0.25 seconds of memory time (accumulative). Added small info window with the controls at the first level. Last update with 19 levels and an ending scene.